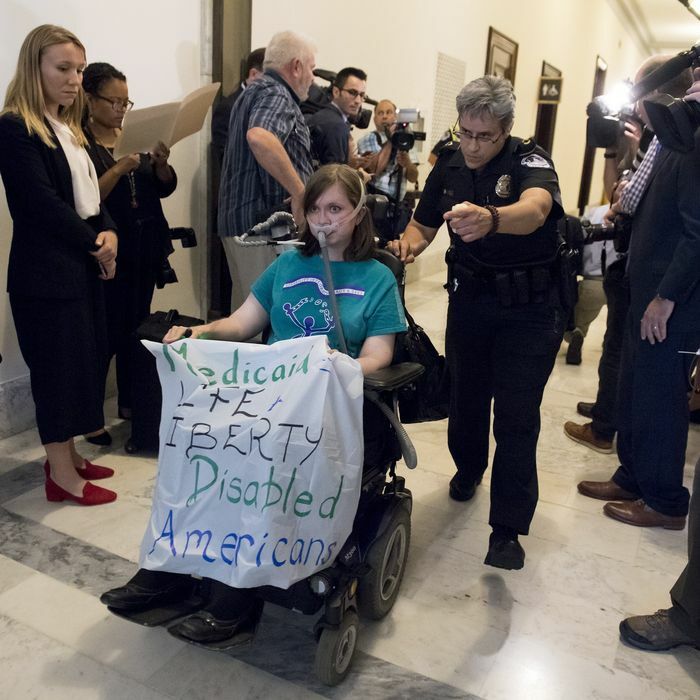 U.S. Capitol Police arrest a woman protesting the health bill outside the office of Senate Majority Leader Mitch McConnell on June 22, 2017. Senators very much need their bill to be perceived as much less damaging to the American health-care system than the House bill. But at the same time, it needs to be close enough in reality to the House bill that the ultimate House-Senate conference product can still get through the lower chamber. So, does the Better Care Reconciliation Act accomplish this? Currently, the answer is no. Many were quick to point out that just like the House bill, the Senate version isn’t about health; it’s about shifting money to the wealthiest Americans by forcing poor people to pay more for less health care. But it’s early, and McConnell seems to be betting that opinions will change rapidly. As Jonathan Chait explained, the idea is that if McConnell starts with a cruel, massively unpopular piece of legislation, small concessions will get disproportionate attention. Suddenly, the story will be that the Senate improved its health bill, not that the underlying legislation is horrific. For the time being, however, we’re still at the stage where people from across the political spectrum pan the bill. Here’s a guide to everyone who’s unhappy with the legislation — and the handful who are excited to be closer to rolling back Obamacare. If you’re a member of one of the 400 wealthiest families in America, the GOP health plan is going to save you about $7 million annually in taxes. If you’re a poor, disabled, or older person on Medicaid; a poor person who doesn’t qualify for Medicaid; an opioid addict; a pregnant woman; a child in a special-education program; or a Planned Parenthood patient, you should be prepared to lose access to care, or at least pay much more for it, as Vox reports. An admonishment from President Obama seems unlikely to dissuade Republicans from their secondary goal of undoing his legacy, but it was worth a try. Four of the most conservative members of the Senate — Rand Paul, Ted Cruz, Ron Johnson, and Mike Lee — were quick to put out a statement on Thursday saying they could not vote for the bill in its current form. Their basic complaint is that it doesn’t go far enough in reducing benefits and subsidies for the poor. Confusingly, these senators may not be the Republican lawmakers most passionately opposed to BRCA. Paul has been complaining that the GOP plan is insufficiently conservative for months, and it seems likely that he’s a hard “no” (it’s worth noting that the Medicaid expansion is quite popular in his home state of Kentucky). It seems the others are complaining as a negotiating tactic. It’s hard to image Cruz wants to go down as the senator who saved Obamacare. McConnell can only afford two GOP defections, and by the New York Times’ count another 28 Republicans were noncommittal on Thursday. There were 31 states that accepted Obamacare’s Medicaid expansion, which added 11 million people to the ranks of the insured. Both Democratic and Republican governors from these states spoke out against the Senate bill. “It appears that the proposed bill will dramatically reduce coverage and will negatively impact our future state budgets,” said Nevada governor Brian Sandoval, a Republican. “I have deep concerns with details in the U.S. Senate’s plan to fix America’s health care system and the resources needed to help our most vulnerable, including those who are dealing with drug addiction, mental illness and chronic health problems and have nowhere else to turn,” said Republican Ohio governor John Kasich. This is a bill that does more to rescue Obamacare than it does to repeal it. Lots of up front bailout $, promised cuts come later. Several medical groups slammed the legislation, including the American Academy of Pediatrics and American Hospital Association. It repeals Obamacare’s tax on health plans, a $144 billion tax cut over 10 years, per an analysis of the House bill. It provides $50 billion in federal funding in the short term to shore up the private insurance market and $62 billion over the longer term for state programs that help stabilize their insurance markets. However, there’s no insurance mandate, which could lead to young, healthy people going without coverage, and the huge cuts to Medicaid could be devastating to certain insurers. “These numbers are staggering,” Pamela Morris, chief executive of CareSource, a Medicaid-focused insurer, told The Wall Street Journal. There are a few people who are excited about BCRA, even without any tweaks. Seventeen Republican senators have already said they intend to vote for it. “It’s much better than Obamacare,” said Senator David Perdue.